When you want to grow your triceps, there are two paths you can take. The first one is the classic ‘train longer and harder’ approach, where you just increase the volume and intensity of your workouts to boost the development of a muscle falling behind those around it. This trick will help you in the short run, but in the long run its positive effects are reduced and turned into negative ones, which means it’s not worth doing. The second path you can take is based in logic – you get a good look at your triceps and figure out that in order to grow it, you must grow all three heads simultaneously, but also all of them together. This will allow you to reach unprecedented size and growth in the long run. Since a lot of people already stick with the first approach to this problem, we’ll be discussing the second one. 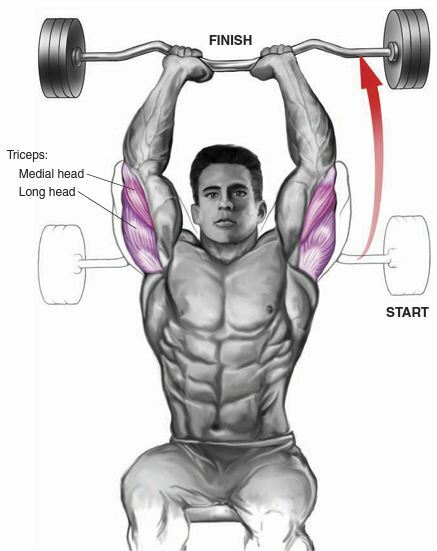 The triceps is composed of three heads – the lateral, long and medial head. It’s important to know which is which and where they’re all located, but it’s absolutely crucial to know how to hit them correctly and put more weight on a specific triceps head than on the other ones. We’ll look at the long head of the triceps, which connects right over the shoulder joint, unlike the two other heads which don’t need to stretch to contract. The long head requires to stretch before it will contract, and for that to happen your arm has to be raised over your head. Here are seven tips that will get your triceps up to par. With a smaller muscle group such as the triceps, you can start by training it twice a week. Since the triceps recuperates incredibly quickly, you’ll need to wait up to three days before working on it again. If you haven’t increased the training frequency of your triceps in 6-8 weeks, this strategy will be fruitful in the end. Also, you should know that training your chest, shoulders and triceps on three consecutive days doesn’t count as the rest your triceps need because these are multijoint exercises which extend your elbows, meaning your triceps is still activated three days in a row, and you want to avoid that. If you want to train your triceps twice per week, you shouldn’t plan to do shoulders or chest in the day before or after this workout. Also, if you want a rigorous workout, you might want to try working on your triceps more than twice per week, but if that happens, you want to vary your exercises. Make sure that your muscle fiber is hit in different places, from different angles. 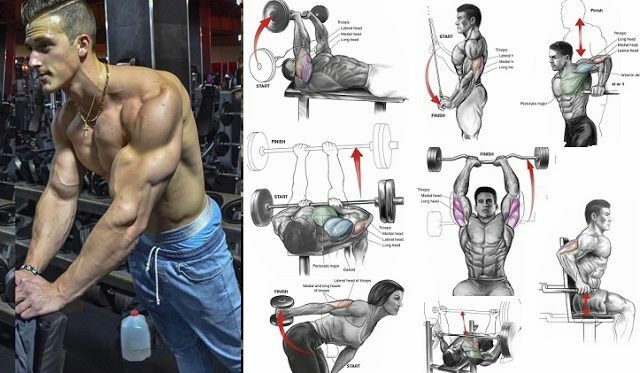 You can even take one of those triceps workouts and turn it into a triceps mass-building workout, focusing the other workouts on overhead exercises. After a chest or shoulder workout, your triceps will be exhausted, but you can solve this problem by just training them right after a large push-day workout to finish off the triceps. A lot of people follow this idea, but you can also do a day for just your arms as your second workout in the week. Your triceps won’t be exhausted, so you’ll be able to work on them with all your energy and focus, as well as heavier weights, which will bring in huge gains. There are two things you’ll need to consider – first, that multijoint movements should always be done before the single-joint ones, early in the routine. This includes the movements for triceps, just as it includes those for other, bigger muscle groups. Secondly, if you’ve hit a ceiling with your training, make some small changes to your movements so that they’d hit the muscles from a different angle, breaking through the ceiling and building new muscle. 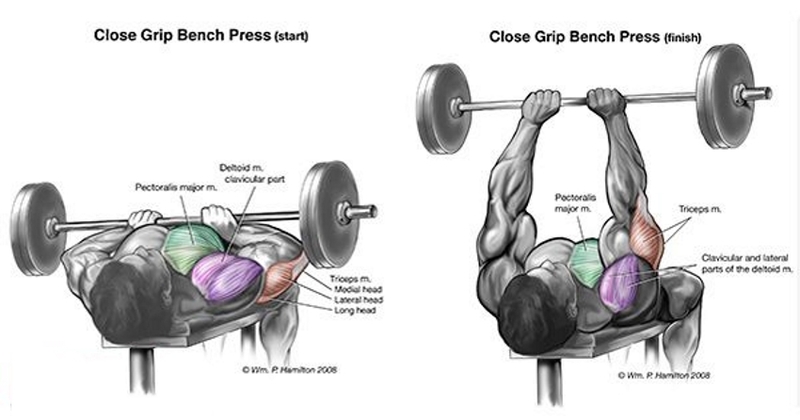 You’re looking for an overhead multijoint triceps exercise that will hit your long head, and there’s a really good one – the close-grip bench press, slightly altered. Your arms will be at a 90 degree angle to your body in this exercise, but your body itself will be on an inclined bench, in a Smith machine. This won’t completely stretch the long head, but if you use a flat bench instead of an inclined one, as well as a new angle, your muscle will activate in a different way than usual, causing it to grow. Take a weight that will let you lift it about 8 times before your muscles fail. If you can lift it more than 8 times, add weight until you get to that limit. At the end of your workout, make sure to go through the lighter weights with higher rep sets. Focusing, in this context, just means that you do the overhead triceps workout first, and then the movements that target your lateral and medial triceps heads, such as kickbacks or triceps press-downs. When your muscle glycogen gets close to depletion, your energy will start dropping and you’ll become fatigued. Overhead movements are, of course, affected by this, so make sure to do them first in your workout – all you have to do is reorganize your workout and make sure that you have days when you hit the other two heads as well. Just because you did some overhead exercise doesn’t make your job finished. If you want to build your long head fibers, you’re going to have to try a lot harder, meaning you’ll need a second overhead extension movement that will hit the triceps from an angle different to the one used in your first long head exercise, with a different intensity. If your first exercise were some seated overhead EZ-bar extensions with 8-10 rep sets, do some one-arm overhead extensions or bent-over rope overhead extensions, with the pulley at the top. Use a weight that will let you lift it 10-12 times, but not more or fewer. This second exercise, with its differing angle, focus and intensity, will let you build the long head of the triceps like nothing else. Any exercise where your arms are over your head will do fine, but to get the best results, try to keep your arms tight inside when finishing the movement. Some overhead dumbbell extensions, with a single dumbbell grabbed by both arms, will definitely help you out. If you’re already big, it might be difficult or impossible to do this without your elbows flaring out, but you can solve this problem by taking an EZ-bar with a wider grip. You can use a dumbbell to do some overhead movements, as well as an EZ-bar or a rope attached to a lower cable. When using dumbbells, be sure to use the bilateral dumbbell overhead press. When using a rope, you can move the cable to the top position, turn around, bend over and do rope extensions right there. If all else fails, there are machines that can provide the exact same sensation. Close-grip bench presses with a slightly inclined bench will contribute as well, but you’ll need to look for other variations of this exercise to give yourself more space to plan your long head workouts, due to the shortness of adequate exercises. 7. Muscle Failure Is Not the End! When beefing up, muscle failure is key. Failure is when you can’t do any more reps of an exercise with proper form. You’ve probably set this up before, reaching failure between 8 and 12 reps. If you can do an extra set or two of an exercise after reaching muscle failure, your muscle will work even more, and the next day your arms will feel like they’re burning. This is just delayed-onset muscle soreness and it’ll be over in a few days. With all that in mind, there is still something we need to look at: intensity. Here are a few ways to boost it when considering your triceps growth. Forced reps. When you do heavy close-grip bench exercises or overhead extensions, have a workout partner assist you in doing a few more extra reps by pushing just a bit up from where you lose power until you lock out. If you’re working on one-arm exercises, use your free arm to spot yourself. Dropsets. Instead of finishing up when you reach muscle failure, grab a weight which is about 25% lighter than the previous one, and keep doing your set. You might enjoy dropsets even more with cable exercises, since all you have to do is change the position of the pin whenever you want to change weight. Peak-contraction training. Instead of dropping your dumbbell to the floor when you’re done, hold and squeeze your triceps when you get to the top of the movement. The more tired you get, the more this hold can be shortened, but you won’t lose any effectiveness.